The Atari personal computer has been around for a couple of years now, and some good software is finally being written for it. For some time, the only software available was (usually) either written in Basic and/or translated from some other machine, usually the Apple. None of these programs really took advantage of the capabilities of the Atari. Now there are quite a few programs available which use the features of the Atari, not just the subset of them required to translate a program from another machine. They use high speed, quality graphics and sound, and were written specifically for the Atari. This review will cover two of what we consider "State of the Art" game software for the Atari. They are from Atari Inc., and are clones of the Atari arcade games Asteroids and Missile Command. Not surprisingly, they bear the same names. Both are on ROM cartridges which plug into the lefthand slot. Both cost $39.95 and require 16K RAM (no disk needed) and joystick(s). This is a popular arcade game in which an evil foreign power launches a missile attack against the area you defend. You command anti-ballistic missiles, which you shoot to intercept the incoming missiles, satellites, planes and smart bombs. In the arcade version, a "trackball" is used to move the cursor for aiming. It allows very high speed movement, and very sensitive positioning. (For example, hitting a "smart missile" exactly on its position is required to destroy it otherwise the missile dodges). Since no "trackball" exists for the personal computer, a joystick is used. Sound effects include an "air raid siren," various explosions, and so forth. They are quite familiar to anyone who has played the arcade game, and make good use of the Atari's capabilities. Visual effects are also rather well done. There are no longer three missile bases controlled by three buttons, as there are in the arcade version. Instead, there is one, with "underground reloading" which enables it to be destroyed, yet pop up with new missiles a bit later. There are three missile bases in one, all controlled by the joystick button. The enemy starts with single missiles, moving slowly, then escalates to MIRV's (missiles which break into multiple missiles), satellites and planes (both of which drop missiles), and finally smart bombs which dodge explosions on the way down. Everything begins to move faster, the bombs get more dense, and so forth, until you are finally overwhelmed. As in the arcade version a bonus city is awarded for every 10,000 points. There are several variations of missile command. An attack consisting solely of smart bombs can be ordered up, if desired, to allow practice with them (a very useful option). There is also a two-player version, and an option to "freeze" the game if you want to get another beer. I rated this game the better of the two. It is excellently done with one exception, and that's the joystick handler. I found it very difficult to position the cursor precisely. The problem is twofold. First, the cursor moves up/down/right/left at the same speed, but moves diagonally as a double increment of up-right, down-left. etc. This makes the diagonal move functionally faster than the others, which makes linear motion darn near impossible. I found myself firing multiple missiles near the same point, and constantly missing. The fine control of the arcade version was missing. I'm not sure how this could be changed. Perhaps the diagonals could he slowed down a bit and some sort of fine position enabled, with coarse movement occurring a bit later on the same joystick press. Despite my reservations, this is a good game. It's not a replacement for Star Raiders, but it is well done and fun to play. Nor does it get boring after a few turns. I recommend it. As an addict of the arcade version of Asteroids, I really looked forward to this game. I had begun to design an Asteroids game for the Atari (laid out the player shapes and so forth, and had the basic algorithms worked out), but when I heard Atari was releasing a version, I gave up. I'm not sure I should have. Asteroids, as you probably know, is a game which places you in a ship in an asteroid field. You shoot at the asteroids, which break into smaller asteroids, and try to avoid collisions. Occasionally an enemy ship enters the field and fires at you. This version of Asteroids is apparently written in graphics mode 7 (Basic) or Antic mode 13. This means it has a "chunky" feeling to its graphics. If you have ever played TRS-80 asteroids you know what I'm talking about. This is particularly surprising when mode 14 is available (graphics 7 1/2) with much better four-color resolution. Indeed, I had planned to use this mode for my version and include three different colors of asteroids. Even graphics 8 (Antic 15) would be a possibility if multicolor asteroids were not required. 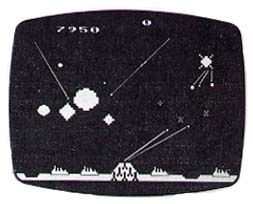 Anyway, I find the low resolution look of the asteroids quite annoying. Also irritating is the very large distance between "turn points" on the ship; in other words, a minimum turn is a large distance. The missiles are limited to four and probably not done with P-M graphics, as there is an option for up to four players at once. Ah, well. The joystick is used as follows: right and left are rotate, forward is thrust, back is hyper/flip, your 180 degrees/shields. The shields are not "timed" as in Deluxe Asteroids, by the way, making for a rather predictable game. Alas, this one is not as good as Missile Command. I liked it, but not enough, and it could have been done better. Possibly the video game version and this version were made as similar as possible to cut development costs. I can understand the problems, having worked this out myself (for example, how to rotate a rocket in only 8 bits; it looks pretty weird in some angles), but still, much better resolution could have been achieved. The multi-player option is a lot of fun, and my wife and I spend much time shooting at each other. One thing you will notice, again, on most Atari games is that they are not CPU bound. 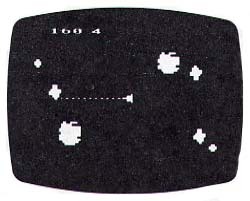 On a version written for another machine, there is a very noticeable slowing of the game when there are many asteroids present. This is the result of all the table updating, checking for collisions, and so forth. The Atari version runs at a constant speed, and is fast. Summary: I play Missile Command much more than Asteroids. All in all, these were fun games to play. Asteroids will entertain those of you not spoiled by the arcade version, which I admittedly am. It is a good sign that these games exist, as it means that more good software for the Atari is becoming available.